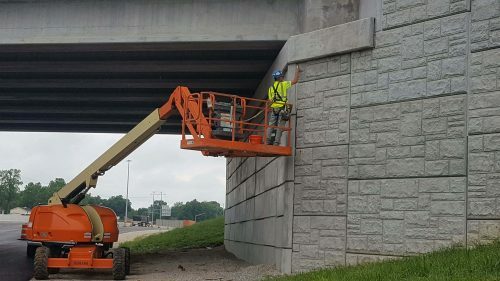 Caulking: I-69 Overpass - Robert Haines Co.
INDOT discovered oversized gaps in between the MSA Panels on numerous overpasses on I-69 just south of Martinsville to Bloomington. These gaps were too wide, which allows sunlight to reach the Geo-fabric. Direct sunlight can cause the fabric to degrade before the wall’s life expectancy. This results in premature failure of the wall segment. The gaps needed to be sealed. 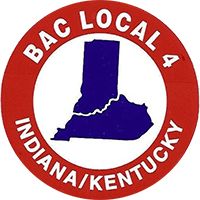 Five employees from Robert Haines Co. sealed the cracks in the gaps over a two-week period. Moving equipment made the project challenging for employees, as the roadway was open during the work. Short ladders and boom lifts (pictured) were used to complete the work. 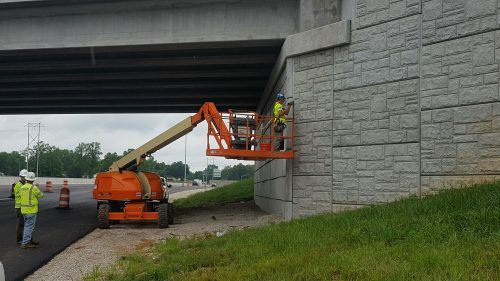 Robert Haines Co. worked directly with Force Construction Company, Inc. and INDOT to propose a sealant for the project that has a life expectancy of 20 years. Plus, it is protected with a manufacturer’s warranty. 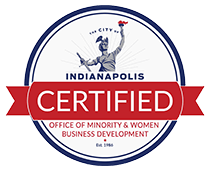 The work was completed in a timely matter, all gaps were sealed to INDOT’s satisfaction, and the project was finished with no impact to consumers. © 2019 Robert Haines Co.